Prices with or without VAT? but may be changed at any time. As every organic material, wood in indoor and especially in outdoor use is subject to enduring exposure. Humidity, direct solar irradiation and the natural ageing process damage the fine wood structure lastingly. In order to stop or slow down this process, different methods are known. Unfortunately most of the common methods for wood conservation are based on chemical additives which are not only of disadvantage to the environment but also to the human health. Abiding by our company´s philosophy "Quality in accordance with Nature", we only offer absolutely natural products for surface finishing. Even since the ancient world oils, resins and waxes were used for the finishing of wooden surfaces. In Japan, Camelia Oil was appreciated not only for its cosmetic impact but also as anti-corrosive protection for knives and weapons. The grand master Stradivari used propolis as component of his violin-varnish and the renaissance painters mixed bright colors with linseed oil, egg and pigment in order to evolve their glamorous creations. 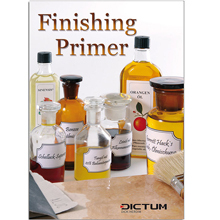 This brochure provides useful information about natural finishing products in their purest form but also as ready-to-use oil and wax mixtures made from natural components. Along with recipe suggestions, we offer tips on how to use and apply the various oils and waxes as well as information about the usage and drying time – everything you need to know to find the right surface treatment for any project. Free delivery within Germany for orders over €150! DICTUM is about more than just tools - For more than 160 years, DICTUM has been offering an extensive range of tools, including garden tools, materials, finishes as well as knives for the kitchen and for outdoor use that meet the highest standards and requirements. In our opinion, first-class tools are defined by haptics, ergonomics, material and manufacturing quality. That is how inspiring, durable tools are made.